This was half marathon #13. 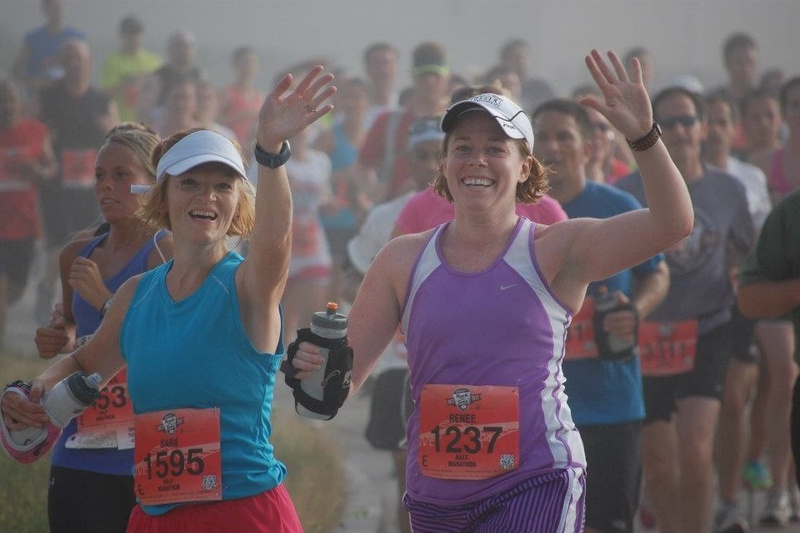 I decided to go back and look at my list of half marathons. It is pretty exciting to see the progress I have made over not a long time. I ran my first half in August of 2009 in 2:10. This past March (2012) I ran a 1:52. That’s a lot of time to drop. At this point running 13.1 miles has become pretty normal to me. It’s not a stretch to get to that distance anymore. I can’t believe I’m saying that, but after months and months of training it’s true. This does not mean 13.1 is easy. This does not mean that 13.1 is not an accomplishment because it is. Each one is a new adventure with different goals. I’ve learned that there are ups and downs to races and that not every one is for a PR. I never planned on really racing this one. Sara and I both decided to just run it. We already both set PRs in the half this year and are at the beginning phases of marathon training. Sara and Me waving to Marty and Annie. We did not practice our waves. I met every single goal I set for this race. We had fun. We didn’t die. And we had beer. We also ran over the Hoan Bridge, both directions, made it up Lafayette Hill and got to the finish line. It was a good day and I am so grateful it wasn’t any hotter. The humidity was rough, but we made it. All smiles once we finished! It was lots of fun to finally run a half through my city. I haven’t run a half in the city I live in since the National Half in 2010. It was an easy morning and I got to see lots of friends before the start, on the course, and at the finish. I am very grateful for and to the running community in Milwaukee. I do want to break 1:50. I know I can do it. I just need the right course and the right day. But my training is switching over to marathon training and that is a whole different game. As always, a huge thanks to the best running buddy I could have ever asked for. Love you Sara. Love you too!!! 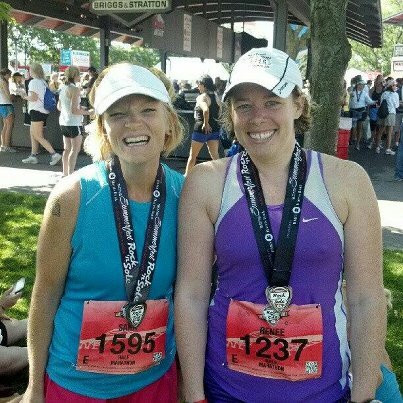 And I am so glad to have such an awesome running buddy to share the ups and downs and difficulties and triumphs. We are badasses. Awesome that that was #13! Congrats on that! I know how you feel about breaking 1:50 because I’m the same way about 2:00, having other, bigger goals makes it tough! Smart to focus on your marathon right now though! Sub 2:00 will happen for you. I am positive. Congrats! The two of you are just adorable in the bottom picture, LOVE IT! You are a runner! And soon will be a half marathoner!